House Assistant Minority Leader James Clyburn (D., S.C.) said his party's entire House leadership team should be replaced if the Democrats fail to recapture the majority in this November's midterms. "If we’re still in the minority, all of us have got to go," he told Politico after the annual fish fry he holds in Columbia, South Carolina on Friday. House Minority Leader Nancy Pelosi (D., Calif.) has faced some calls from within her caucus to step aside but has said such a move would thrust House Democrats into chaos. With a younger class of Democrats clamoring to break into leadership, Clyburn, 77, appeared at the fish fry alongside Rep. Tim Ryan, the Ohio Democrat who challenged Pelosi unsuccessfully for her leadership position in 2016. Clyburn, the assistant minority leader and the highest ranking African-American in Congress, referred repeatedly to Ryan as a "good friend" and a favorite drinking partner in Washington. 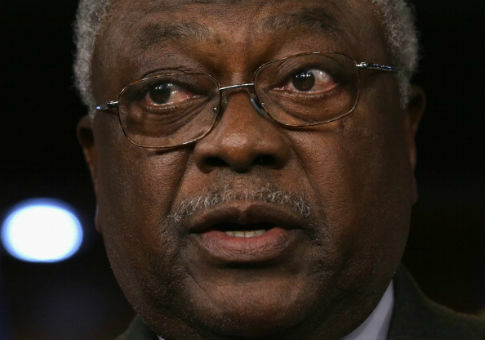 A glass of Jack Daniel's in hand at the fish fry, a mainstay on the Democratic Party circuit, Clyburn said he did not take Ryan’s leadership challenge personally, adding, "I understand exactly what he was saying." Clyburn said the party would undertake a "real assessment" of current leadership following the elections, regardless of the Democrats' success. Ryan told Politico his view that Democrats would be better served off without Pelosi as House Leader remained the same. Pelosi has heard some grumblings from within the ranks following the Democrats' disappointment in 2016, but as of last month, she remained confident in her hold on power. "I am a master legislator, I am a shrewd politician and I have a following in the country that, apart from a presidential candidate, nobody else can claim," she said in March. This entry was posted in Politics and tagged 2018 Election, James Clyburn, Nancy Pelosi. Bookmark the permalink.